I had no idea this kind of modding was going on with the Dell Inspiron 910, aka the Mini 9! Looks like several teams of hackers have figured out how to boot the Intel processor edition of Mac OS X 10.5 Leopard on the Mini 9, which I have sitting on my desk right now. "I’m a huge fan of ultra portables! They are small, light and just powerful enough to do what you need to get done. Sure I run Windows (in VMware), but for me the Mac OS better fits my lifestyle, but if you are looking for an ultra portable you are going to have to look beyond Cupertino. So, when I got the Dell mini 9 all I wanted to do was put Leopard on it. With a little bit of tinkering and some help from a good blogging buddy Kevin Tofel I was able to painlessly install 10.5.4 on the little guy." 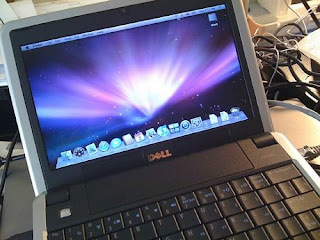 For directions on how to bake Mac OS X 10.5 Leopard into your Dell Mini 9, check out UneasySilence.com now. Thanks for the tip! I'll be sure to check out the My Dell Mini site during the week. Cool profile photo by the way. I was just down at Universal Studios this past December.